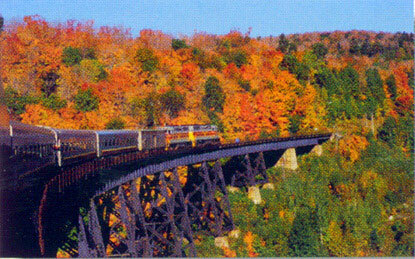 Fall Colors on the Agawa Canyon Train Tour are fantastically beautiful. Agawa Canyon is in the Canadian or Pre-Cambrian Shield, the oldest Mountain range in the world and from Sault Ste Marie to Agawa Canyon the train tour route is covered with a diverse hardwood forest that turns red, purple, gold and yellow in the fall from early September through mid October. The once towering mountains higher than the Rocky Mountains were worn down over Billions of years and many ice ages to rolling hills of rugged but accessible beauty. The Canadian Shield is a basin shaped shallow mountain range that extends from Northern Manitoba through Northern Ontario and Northern Quebec cradling the lower portion of Hudson’s Bay and James Bay. The Canadian Shield is the oldest mountain range in the world, some parts of which are over 3 Billion years old. It is thought to have been higher than the Rocky Mountains in it’s youth but so many ice ages have descended over it from the north pushing rocks and soil as far as the mid United States, that it is for the most part a much gentler, more intimate and accessible, rolling mountain range. Agawa Canyon was created by faulting in the Canadian Shield over 1.2 billion years ago that was deepened and enlarged by the erosive action of the Agawa River . The Agawa Canyon Train Tour is one of the most popular train excursions in North America. This one day wilderness excursion will take you 114 miles north of Sault Ste. Marie, over towering trestles, alongside pristine northern lakes and rivers, and through the awesome granite rock formations and mixed forests of the lower Canadian Shield. Through the large picture windows of your comfortable coach, you will experience the same vistas and panoramas that inspired the Group of Seven to create some of Canada’s most notable landscape art. Just when you thought you’d seen it all, we’ll coast 500 feet down to the floor of the Agawa Canyon, where you will have almost two hours to experience the pristine beauty up close. The whole family can enjoy scenic walks on gravelled trails, four waterfalls or an invigorating climb up over 300 stairs to the breathtaking Lookout platform, perched 250 feet above the tracks. There will be plenty to photograph during your excursion so be sure to pack your camera and lots of film. For your stay in Canyon Park we recommend that you wear recreational clothing and footwear..